In racism’s case, the arbitrary and superficial criteria was skin color, which supposedly justified slavery, then denial of citizenship, then denial of voting rights, then segregation, and so on. It is nigh-impossible to look at that and not see a striking resemblance to how abortion apologists deny personhood to preborn humans, using morally-irrelevant criteria like developmental stage and dependence (sometimes even appearance) as excuses to ignore the clear and overwhelming scientific proof that they are every bit as human as you, me, or Cecile Richards. I think no one ever conceived of this category before the abortion controversy. It looks very suspiciously like the category was invented to justify the killing, for its only members are the humans we happen to be now killing and want to keep killing and want to justify killing. Beyond the central truth that abortion is inherently anti-equality, Richards’s posturing doesn’t square with history. First, there are scores of haunting parallels between abortion and slavery—advocates of both employed many similar arguments, claimed the mantle of modernity, rejected constitutional originalism, and more. Second, after slavery was abolished, the Ku Klux Klan killed fewer blacks over the course of its entire history than Planned Parenthood kills in a single year. In fact, the practice Richards champions is doing more than anything else today to pick up the work institutionalized racism left behind, making abortion the number one killer of black Americans. Not that this should surprise anyone, when its employees have been known to agree to earmark donations specifically to kill black kids. It is kind of interesting now to see these sepia-toned photos and from day one, there were women lined up down the block pushing baby strollers with babies on their shoulders. Ten days later, an undercover cop who was posing as a mother busted Margaret [Sanger] and threw her in jail. I don’t think that today’s event represented a free exchange of ideas or a spirit of dialogue. 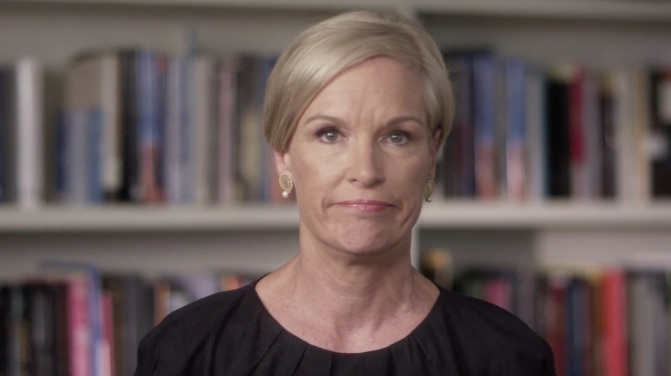 Instead, Cecile Richards was given a platform to spew her beliefs unchallenged.